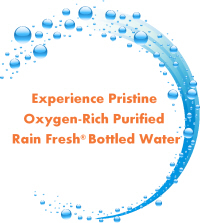 Rain Fresh® bottled water is a high quality, oxygen-rich, purified water with a refreshing taste. The approved source water is purified using the most advanced methods in combination with proprietary technologies listed here in our 12 step process. Trashes the big stuff, like dirt and other unwanted sediments. Bye-bye iron, lead, mercury and copper. Hasta la vista chlorine, pesticides and nasty chemicals! Viruses and bacteria are totally annihilated. A flow-through filter connected to a great big copper antenna driven into the earth, that restores the water's vibe and adds electrons from the earth. Stops disease-causing microbes in their tracks. The big kahuna filter! What does it do? Add all the previous filters together. raise to the umpteenth degree, and you're getting close. Erases the molecular memory of the water so it doesn't ever resemble anything less than ultrapure. Kind of like two tuning forks that positively energize the water by tuning its vibrational frequency. Oxidizes and disinfects the water one more time (we're nothing if not thorough!). Water is spun in a vortex column at high velocity as food grade oxygen is infused and stabilized into the water structure. Oxygen level tests performed several months later show the extra oxygen is there to stay! Filled, capped and sealed with love.